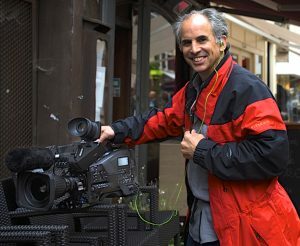 Roger is the cinematographer on most of the films he creates. He works freelance, shooting The Gates for Maysles Films, Chuck Berry, Little Richard, Jerry Lee Lewis, Fats Domino for The Rock & Roll Hall of Fame, Mayan pyramids for the National Gallery of Art and many others. Roger shoots food, gardens, travel, portraits, food and whatever else catches his eye. His work has appeared in Town & Country, Saveur, Budget Travel, Garden Design, MetHome, and Newsweek. He photographed The Brisket Book by Stephanie Pierson. Ready Steady Shoot: A Pro’s Guide to Smartphone Video is an upbeat and eBook for anyone who shoots video: for Snapchat, Instagram, Facebook Stories, vacations, kids’ events, nights out, with any device: smartphone, digital still camera or even an expensive camcorder. Technique is the secret sauce, not technology.